One in nine adults in the US has chronic kidney disease, and 82,000 die each year from kidney failure. Diabetes and high blood pressure are the two most common causes, but there are numerous other causes of kidney disease. Untreated, chronic kidney disease leads to kidney failure. Current treatments can slow the progression of chronic kidney disease but there is no treatment that can halt the progression of the disease, or reverse damage that has already occurred. The underlying mechanism in the progression of chronic kidney disease to kidney failure is the accumulation of scar tissue in the kidney due to fibrosis. Fibrosis is pathological scarring that can lead to organ failure and eventual death. Although it is not known what triggers the fibrotic response, kidney fibrosis is characterized by the presence of myofibroblasts, which are cells that produce scar tissue, and also matrix and matrix-remodeling genes. Experimental Unilateral Ureter Obstruction (UUO) represents a model for obstructive nephropathy but also allows insight into the process of interstitial fibrosis that is a common characteristic of many chronic nephropathies. 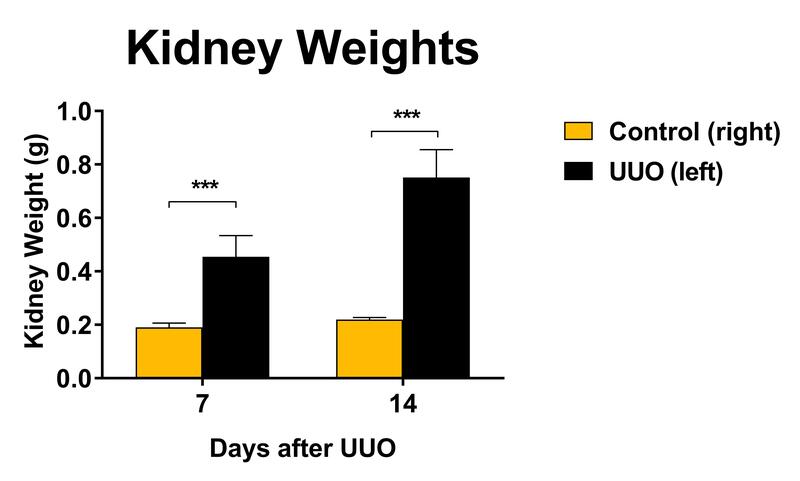 Markers of renal fibrosis, such as interstitial fibroblasts, interstitial volume, mRNA and protein expression for collagen I, are all increased in UUO animals, making the UUO model a good experimental system for studying fibrosis. In this model of fibrosis, animals are subject to UUO on Day 0 and the kidneys are removed (for histological assessment of fibrosis) and blood is collected on day 14.